TORONTO (AP) As he drove to the basket late in the fourth quarter, DeMar DeRozan lost his footing and fell onto his backside. While going down, the All-Star guard managed to toss the ball to the 3-point line, where teammate Kyle Lowry stepped up and drained a go-ahead jumper. 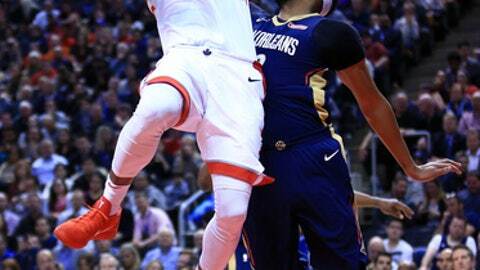 It was a huge play for the Toronto Raptors, and indicative of the kind of night it was for the New Orleans Pelicans. DeRozan scored 33 points, Serge Ibaka had 19 and the Raptors beat New Orleans 122-118 on Thursday for their fifth straight win over the Pelicans. Lowry scored six of his 18 points in the fourth quarter and Jonas Valanciunas grabbed a game-high 13 rebounds as the Raptors won for the 13th time in 16 meetings with New Orleans. Jrue Holiday had a season-high 34 points and 11 assists, and DeMarcus Cousins added 20 points and 15 rebounds for the Pelicans in the finale of a four-game road trip. New Orleans had won a season-best three straight. Anthony Davis scored 18 points, E’Twaun Moore had 13 and Dante Cunningham 11 for the Pelicans. Cousins and Davis each had 30-plus points and 10-plus rebounds in Tuesday’s win at Indiana. DeRozan said it was important to keep the two big men in check. Toronto made a season-high 16 3-pointers, four by Lowry. His final 3 of the game came off DeRozan’s pass with 3:21 remaining and put the Raptors up 109-107, a lead they did not relinquish. Despite the outcome, Toronto coach Dwane Casey wasn’t pleased with his team’s defensive effort. ”We have to give a better resistance,” he said. Toronto had 10 offensive rebounds and 19 second-chance points. The Raptors also scored 19 points off 14 Pelicans turnovers. DeRozan finished 11 for 13 at the free throw line, connecting on four of six attempts in the final 20 seconds. ”As a competitor, you want to be in those situations,” he said. Pelicans: Cousins was called for a technical foul while sitting on the bench late in the second. … All five New Orleans starters scored in double figures. … Cousins had his NBA-best 11th double-double. Raptors: DeRozan attempted a team-high five 3s in the first, making two of them. … Ibaka received a technical for sticking his tongue out at the New Orleans bench following a made basket in the third. … C Lucas Nogueira picked up three fouls in 87 seconds of action in the first and did not play again. New Orleans lost for the first time this season when shooting better than 50 percent from the floor. The Pelicans finished 44 for 82 (53.7 percent). Toronto’s 98 field goal attempts were a season high. The game featured 22 lead changes, seven in the final quarter. Pelicans: Host the Los Angeles Clippers on Saturday night. New Orleans has lost seven of its past 10 meetings with the Clippers, and 15 of the last 20. Raptors: Visit the Boston Celtics on Sunday afternoon, looking to end a six-game losing streak at TD Garden.